The interest in strengthening commercial bonds between Cuba and Curacao was highlighted in Havana in the context of the visit to the island of Eugene Rhuggenaath, Minister of Economic Development of that country, accompanied by representatives of 20 companies from various sectors. 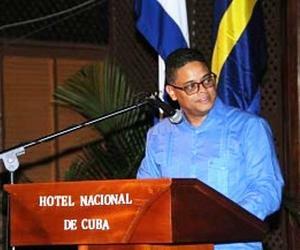 In a business forum held at the Hotel Nacional, Omar Fernandez, secretary general of the Cuban Chamber of Commerce, stressed the importance of the current mission, composed of representatives of companies from areas such as transport, manufacturing, logistics, finance and energy. As an example of the progress achieved from the bilateral meetings held in 2015, Fernandez mentioned the signing on Thursday of a memorandum of understanding between the Curinde Company of Curacao and Cuba’s Comercial Cupet S.A., which reflects the intention of both parties with regard to the execution of joint business and investment works. Also signed on Thursday was a cooperation agreement between the Chambers of Commerce of Cuba and Curacao, an important tool towards contributing to the development of relations, pointed out the Cuban official. However, he acknowledged the need to continue working on identifying new business opportunities, noting the wide investment possibilities opened in the Cuban nation, as part of the process of updating its economic model.